If you have not read much on the topic of the anthropic principle and the issue of possible fine-tuning in the universe, it may be hard to follow the topic. Discussions typically involves subatomic physics, cosmology, biology, evolution and some other subjects that don't exactly make light reading. I think that the topic will be easier to understand if we condense it into one simple table that summarizes the most relevant facts. I have created such a table, which appears below. The left column of the table lists various items that appear in nature. The right column lists requirements of those items. The table is in chronological order. It starts out with requirements that must be met in the very beginning, near the time of the Big Bang, if the universe is ever going to end up with people like us, inhabitants of a technical civilization living near a sunlike star. Towards the end of the table are items that appeared billions of years later in time. The final item in the table is “Civilizations near sunlike stars.” It is interesting that for the last item to come into existence, all of the previous items in the list must previously come into existence. I have added color coding which makes the various interlinked dependencies much easier to follow. I will now explain why each item has the requirements I have listed. Row 2 (up quarks and down quarks, electrons): The particles in the nuclei of atoms (protons and neutrons) are made up of smaller particles called up quarks and down quarks. A requirement of the large-scale existence of up quarks and down quarks (and also electrons) is what scientists call matter/antimatter asymmetry (a situation where matter is vastly more abundant than antimatter). This is a puzzle to scientists, because the standard model of physics seems to predict that matter and antimatter should have existed in equal amounts at the time of the Big Bang, which would have caused both types of particles to collide with each other and convert into energy, leaving almost nothing but energy in the universe. A requirement for electrons is the Higgs field, and on this page a physicist says that the electron would not have mass without the Higgs field. Row 3 (protons, neutrons): The simple requirement is that there be up quarks and down quarks, discussed in the previous paragraph. Row 4 (hydrogen atoms): The requirement for a hydrogen atom is that you have one proton and one electron, and also the electromagnetic force, the force of attraction between a proton and an electron. Without that force, electrons would not have any tendency to orbit a nucleus. Row 5 (galaxies): Galaxies are huge collections of stars. There are many requirements for the formation of galaxies after the Big Bang. The universe had to begin with a fine-tuned expansion rate, as a slighter higher rate would have caused an expansion too fast for galaxies to form, and a slightly slower rate would have caused all matter to collapse into superdense black holes. Scientists also say that numerous other things had to be just right (the other items listed in this row). One requirement is primordial density perturbations greater than .000001 and less than .0001, as explained here. One particularly severe requirement seems to involve dark energy, which is regarded pretty much the same as the cosmological constant. Cosmologists conclude that the level of dark energy seems to have been fine-tuned to something like 1 part in 1060 or one part in 10120. The issue, called the vacuum catastrophe, has been fretted over by many physicists. This paper refers to the “tremendous, unsolved naturalness problem” posed by the cosmological constant. Row 6 (carbon atoms): This row refers to the abundant existence of carbon atoms, something which ends up having lots of requirements. Besides the previously mentioned requirements for the hydrogen atom (protons, electrons, and the electromagnetic force), there are the additional requirements of the neutron and the strong nuclear force (the two of them allow you to have a carbon nucleus that holds together, despite the mutual repulsion between the protons). There is also the requirement that you have a law of nature called the Pauli Exclusion Principle, something that is quite necessary for both solid matter and complex carbon bonds. Then there is an additional requirement for something called nuclear resonances, which assures that carbon is produced in abundant quantities by stars through a process called the triple alpha process. Without this additional requirement, there would not be enough carbon (which wasn't produced in the Big Bang). This point has been widely discussed by scientists such as Hoyle, and in this scientific paper stating that a 0.4% change in one parameter would have left us without a universe abundant in both carbon and oxygen. An additional requirement that I had no space to list in my table is the requirement that the neutron mass be higher than the proton mass. 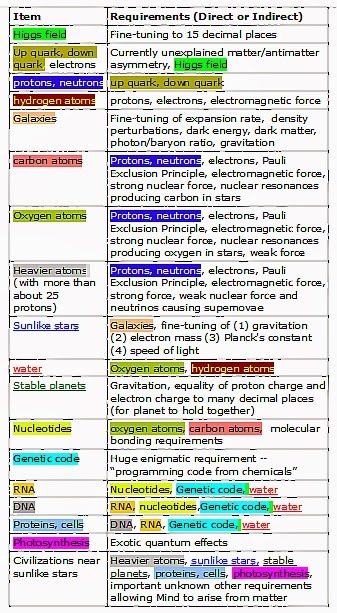 Row 7 (oxygen atoms): Oxygen atoms have all the same requirements of carbon atoms, including the same special requirement involving nuclear resonances, necessary for oxygen to be produced by stars in abundant amounts. The scientific paper here argues that there would not be much oxygen without the weak nuclear force, so I have also listed that as a requirement. Row 8 (Heavier atoms): By heavier atoms I mean all atoms than have more than about 25 protons (which includes copper, lead, silver, gold, zinc, tin, and probably also iron). These types of atoms have most of the same requirements of carbon atoms and oxygen atoms, except that to have these atoms in abundance you don't need nuclear resonances but instead the stellar explosions called supernovae explosions (explosions of stars that produce heavy elements such as lead and iron). These supernovae explosions require a tiny particle called the neutrino and a force called the weak nuclear force. Row 9 (Sunlike stars): I may define sunlike stars as those that are white, yellow, or orange (or some combination of those colors). Sunlike stars require galaxies (since if galaxies had not formed, there would be no stars). Sunlike stars also require a very delicate fine-tuning of some of the most fundamental constants of nature. The physicist Paul Davies says on page 73 of The Accidental Universe: “If gravity were very slightly weaker, or electromagnetism very slightly stronger (or the electron slightly less massive relative to the proton), all stars would be red dwarfs. A correspondingly tiny change the other way, and they would all be blue giants.” Blue giants are too-short lived for life to evolve near them, and red dwarf stars are not believed to be as favorable for life's evolution as sunlike stars. Row 10 (water): Water requires oxygen atoms and hydrogen atoms, as we can tell from its formula H20. Because of its remarkable features that make it unique among liquids, there are probably additional requirements for water, but I haven't listed them. 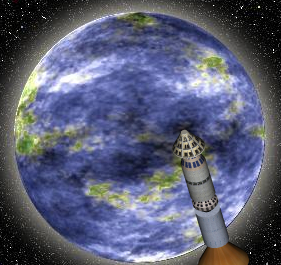 Row 11 (stable planets): One requirement for stable planets is gravitation, the force that holds planets and stars together. 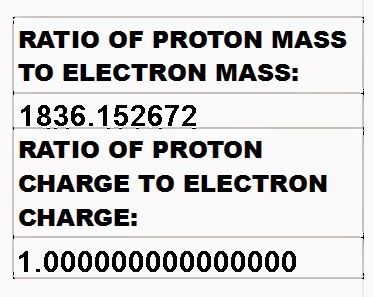 But there is another very interesting requirement: that the electric charge of the proton exactly match the electric charge of the electron, to many decimal places. Electromagnetism (the fundamental force involving electric charges) is roughly 1036 times stronger than gravitation, the weakest of the fundamental forces by far. Consequently a very slight mismatch between the charge of the electron and the proton would cause electromagnetism (roughly a trillion trillion trillion times stronger than gravitation) to completely overwhelm the gravity holding the planet together. In his book The Symbiotic Universe, astronomer George Greenstein (a professor emeritus at Amherst College) says this about the equality of the proton and electron charges: "Relatively small things like stones, people, and the like would fly apart if the two charges differed by as little as one part in 100 billion. Large structures like the Earth and the Sun require for their existence a yet more perfect balance of one part in a billion billion." In fact, experiments do indicate that the charge of the proton and the electron match to eighteen decimal places. Row 12 (nucleotides): Nucleotides are molecules that are the building blocks of RNA and DNA, molecules essential for life. Nucleotides require three types of atoms mentioned above (carbon, oxygen, and hydrogen atoms), as well as phosphorus atoms. They also require physics to be arranged in a way that allows for atoms to combine to make molecules consisting of multiple atoms. Row 13 (genetic code): The genetic code is a semantic framework used by DNA and RNA, one in which particular combination of nucleotides stand for particular amino acids. The genetic code could roughly be called the software used by DNA and RNA. The origin of this code is one of science's great mysteries. We do not know how this code (required for all biological evolution) appeared from mere chemicals. This is the “code from chemicals” problem described in this blog post. Row 14 (RNA): RNA is one of the two main molecules used by all living things, and it is believed to have preceded the more well-known and more complicated molecule DNA. It requires nucleotides (from which RNA is built), as well as the genetic code and water (as a substrate). Row 15 (DNA): DNA requires nucleotides (from which it is built), as well as the genetic code and water. I also list RNA as a requirement since it is believed that RNA was a necessary predecessor of DNA. Row 16 (Proteins, cells): Proteins are made by DNA and RNA using the genetic code. Requirements include water and amino acids (which I didn't list in the table for space reasons). Row 17 (Photosynthesis): Photosynthesis is the process by which plants convert sunlight to chemical energy. Recent studies suggest that photosynthesis uses exotic quantum effects. Row 18 (Civilizations near sunlike stars): Now we come to the last and most important row, which mentions civilizations such as our civilization. There are many requirements for such a civilization. All of the items on the 17 previous rows on the table are indirect or direct requirements of civilizations near sunlike stars. The well-understood direct requirements of such civilizations are heavier atoms (needed so that the civilization can have the metals needed for technology), sunlike stars, stable planets, proteins, cells, and photosynthesis (the last one being necessary even if the beings in a civilization ate nothing but meat, because they would still rely on a food chain that would require photosynthesis). There is also a poorly understood requirement that does not occur previously on the list – the requirement that somehow unconscious matter can produce Mind of the type that humans have. That is a huge additional requirement. It may require additional laws of nature, or perhaps exotic features of quantum mechanics, as Penrose and Hameoff have suggested. Penrose and Hameroff say here that their “orchestrated objective reduction” theory “suggests that there is a connection between the brainʼs biomolecular processes and the basic structure of the universe,” and yesterday's news reported a finding that supports such a theory. The matter is still undecided, but we do seem to have a huge additional requirement from nature in order to go from mere cellular life to conscious life. The table I have created illustrates the great number of intertwining requirements needed for the universe to be consistent with the eventual appearance of civilizations such as ours. A huge amount of fine-tuning is required to meet these requirements, most notably in rows 1, 5, 9, and 11, each of which require “1 in a trillion” type coincidences with a very low likelihood of randomly occurring, We also have the very mysterious requirements of rows 13 and row 18, both of which almost seem to require “blood from stone” type of requirements (row 13 involving the origin of the genetic code from chemicals, and row 18 involving the origin of human-like consciousness from mere matter). Postscript (2/14/14): The table of anthropic requirements above is not at all a complete list of all of the requirements for creatures like us to exist. For example, I didn't list a major additional requirement for atoms: a dependency on Heisenberg's Uncertainty Principle. As discussed here, were it not for this law of nature, electrons would fall into the nucleus of an atom, preventing any type of atom from existing. The Origin of Life: Programmatically Predestined?